Design and Execution Consultants for all type of projects. 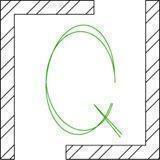 QED'S Studio conducts classes in Commercial Interior Designers and Residential Interior Designers. It is located in New Industrial TWP, Faridabad. It takes Regular Classes- at the Institute.